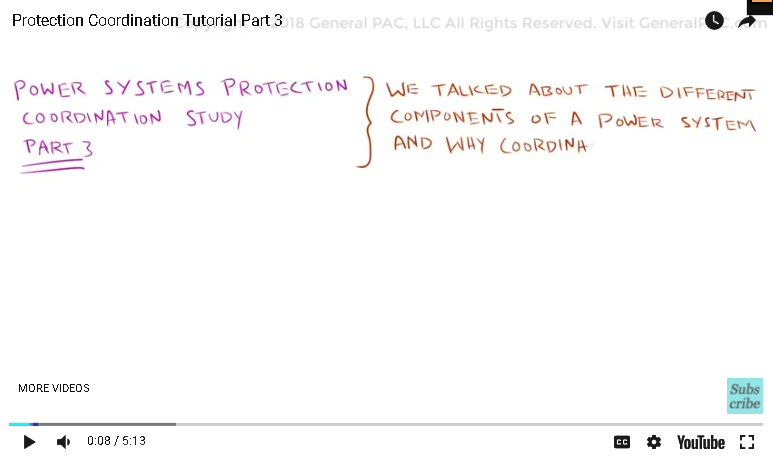 Power Systems Protective Device Coordination Part 3. In part 2 we talked about the different components of a power system and why coordination works. In part 3, we would be discussing the primary goals of coordination and the strategies involved to make it work. There are two primary goals associated with coordination. The first one is to ensure equipment protection. This could be a cable, a motor, a transformer, generator, or a static load. Through coordination, we can achieve multiple layers of protection. We can also coordinate these layers so the fault or abnormality are localized to a zone. This ensures continuity of power to the rest of the system, with the abnormality being isolated to its particular location. We will be discussing this in more details as we continue this series. Before we talk about how to actually achieve coordination, we must first consider the strategies involved. There are two types of characteristics which we can use to coordinate the protective devices in a power system. The first one is the definite time characteristic which defines a fixed time delay before the tripping action of the protective device. To demonstrate this concept, let us consider a facility with a 50KVA, 60Amps static load present on the load end of the 480V bus. It is being supplied power through a 480 volt cable from the upstream bus. As discussed in part 2, all breakers should be rated at some percentage above the full load amperes of the downstream load. Breaker “C” is rated 80 Amps at 480V, Breaker “B” is 120 Amps at 480 volts and Breaker “A” is rated 100 Amps at 4.16 kV. 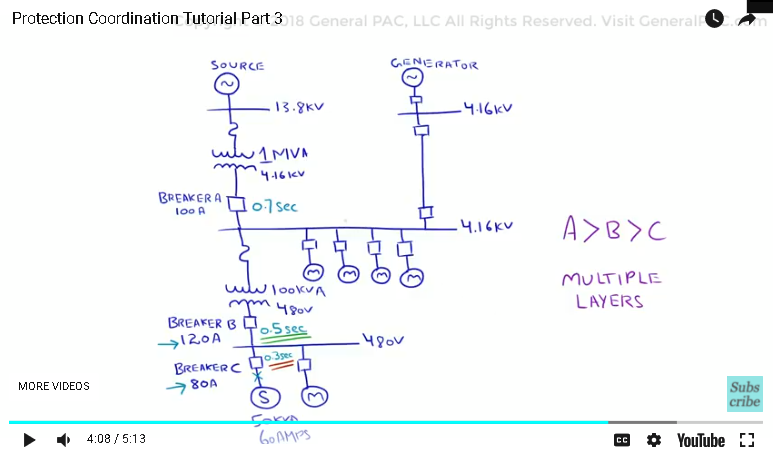 Keep in mind the voltage difference between Breaker “A” and Breaker “B”. Let’s consider an abnormality occurring at the load terminals beyond Breaker “C”. This abnormality causes the current to suddenly increase beyond the normal loading levels. Since breaker “C” is directly connected to the load, we shall require it to have the fastest tripping time to ensure fault localization. Breaker “C” is given a definite trip time of 0.30 seconds. So if the abnormal current is above the trip rating of the breaker, which is 80 amps, and the current remains for at least 0.30 seconds, then Breaker “C” will trip to isolate the abnormality. 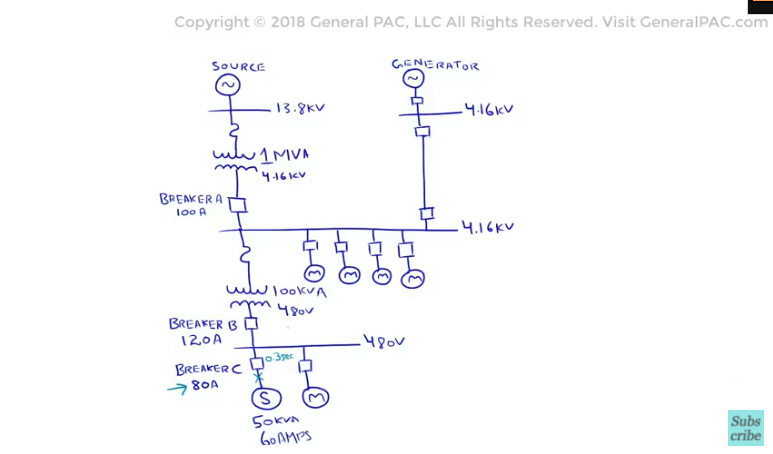 To achieve coordination with the upstream breaker using definite time characteristics, we would need to add some delay to Breaker “B” that is greater than Breaker “C” plus some margin. Suppose this margin was 0.20 seconds. This means that Breaker “B” will have a definite time delay of 0.50 seconds. If there is an abnormally high current beyond Breaker “B” that is greater than the trip rating of the Breaker, which is 120 Amps, and this abnormal current remains longer than the definite time delay of 0.50 seconds, then Breaker “B” shall trip to localize the abnormal area. Please note that if the abnormally high current was beyond Breaker “C”, then Breaker “C” should isolate the abnormality since it has a definite time delay of only 0.30 seconds. If the abnormality is between Breaker “B” and Breaker “C”, then Breaker “B” will isolate the abnormality with the time delay of 0.50 seconds. Following this design, lets select a definite time delay of 0.70 seconds for Breaker “A”. Similar operations now occur between Breaker “A”, Breaker “B”, and Breaker “C”. With this strategy, we have achieved some level of coordination. Additionally, we have multiple layers of protection. If Breaker “C” does not trip and isolate the fault for some reason, then we should expect Breaker “B” to trip with 0.50 seconds of delay. This is a simple strategy with some benefits especially for abnormality at low current levels. The disadvantage of this strategy occurs with high current levels. If we consider a 3 phase fault at the 4.16 KV bus which produces an abnormally high current, this strategy may not provide good protection. Because this strategy uses definite time delay, and to make coordination possible, each layer of protection has some delay. We should expect the highest layer of protection to have the most delay. This is true in our case as well because Breaker “A”, will wait 0.70 seconds before tripping for the high-fault current. If the fault current is high enough, it could result in possible damage to the 4.16 KV bus, and a power blackout could occur, disrupting power to the other loads downstream of the bus. This example highlights a major flaw of using definite time characteristics to achieve breaker coordination, which brings us to another more useful strategy. This strategy involves the application of inverse time overcurrent characteristic, which makes it possible for the breaker to vary its delay time directly with the amount of abnormal current. This will be discussed in more detail in part 4.